Make It Fancy or Make It Work? We arrived late. The tour bus had just left and it was the last one for the day. 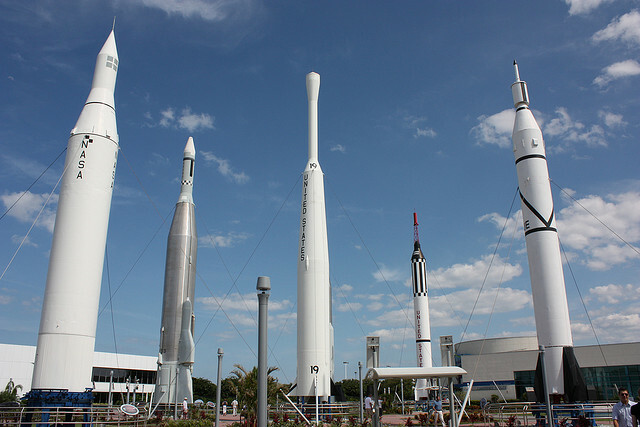 So the only thing we could do now at the Kennedy Space Center in Cape Canaveral was check out The Rocket Garden and a Shuttle prototype turned into an exposition. Turned out, I didn’t need a tour. There was something that totally captivated me for the next hour: The old rockets. They turned out to be so unexpectedly “plain jane” and low-tech. So… looking for the word here… mundane. The gloss of a picture in the book came off, and what was left was a sheet of metal clumsily wrapped into a tube. All the attributes of a son-and-dad-school-project-finished-the-night-before-it-was-due (talking from experience here) were present: rough edges, mill marks all around, badly covered by uneven paint. They looked like they were made in a garage. And in a way, they were. I found it difficult to imagine them fly. Even more so to imagine someone crawl into that tin bucket of the cabin, strap themselves to a big barrel of kerosene and go for a dangerous ride. Nonetheless, there they were. Artifacts of the glorious past. Testament to the courageous epoch. These powerful machine that were able to overcome the Earth’s gravity and take the man into outer space, didn’t have chrome moldings or glossy clear coat. They were not built for the looks. They were created to get the job done. Here’s what this story has to do with marketing. If you are like most people, you let your ego get in the way and are spending way too much time and money on the “looks” of your marketing. If that is you, remember that in the end, the only person that’s going to be impressed is you. Your customers won’t care. Ask yourself: Are you trying to make it fancy or make it work? If you want results, then study other businesses’ ads. Start with those plane-jane all-text ones that trick you into thinking you are reading an editorial. People who run these ads treat them like their sales force: If the ad doesn’t produce results it gets immediately pulled. Just as the sales person who doesn’t sell gets fired. Gawky machines that helped the man conquer Space didn’t need to be slick. The ad that will help you to conquer your market won’t be a slick one either.